As new methodologies and materials permeate the industry, leaders in geotechnical engineering are challenged to continuously improve, advancing standards and best practices in order to remain competitive and deliver value through groundbreaking services. From hydraulic modeling to scour design services, instrumentation technology, pile testing, and more, bridge engineering techniques have and continue to hurtle forward as innovative geotechnical engineers push the envelope of success. 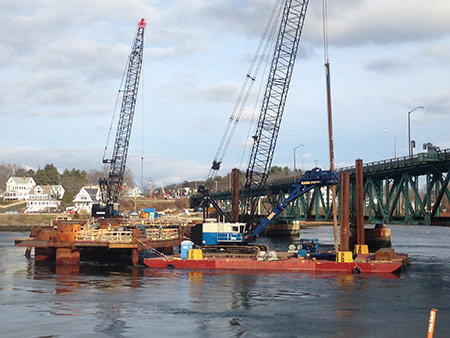 A significant example of how artful engineering can overcome seemingly impossible challenges is the Sarah Mildred Long bridge replacement project, which includes over-water field exploration, drilled shaft design, construction observation and non-destructive testing. It also demonstrates the impact of the construction manager/general contractor project delivery method on foundation design and construction. The first of its kind in the region, the Sarah Mildred Long bridge replacement tested the limits of bridge design for its geotechnical engineers, GZA GeoEnvironmental Inc.
A double-deck structure that opened in 1940, the existing bridge carried the Route 1 Bypass roadway on the upper level and a single-track railroad on the lower level over the Piscataqua River between Kittery, Maine, and Portsmouth, NH. The original structure consisted of 22 spans and an approximate total length of 2,750 feet. The middle spans were vertical lift spans, providing an approximate 200-foot wide navigation channel. The replacement bridge is also a double-deck structure situated upstream from the existing bridge that includes a wider lift span for navigation by modern, larger barges. The river spanned by the bridge is tidal, experiencing one of the swiftest currents in the world (up to five knots), with tidal fluctuations of nine to 10 feet. The dangerous current created navigational difficulty in the river during GZA’s subsurface exploration program, necessitating that each test boring be completed in one shift, including collection of bedrock core samples up to 50 feet into bedrock. Some borings took nearly 24 hours to complete. A combination of thin overburden soils, hard bedrock and large vertical and lateral loading imposed by the bridge required GZA to provide creative design solutions to develop a practical, constructible, cost-effective foundation design. The final design included one to two drilled shafts per approach pier, with 10-foot diameter rock sockets cored up to 30 feet into hard bedrock. Tower pier caps included more shafts due to the high lateral loads caused by barge impact. The critical nature of the successful installation of each shaft lead to nearly full-time construction oversight during drilled shaft installation to assess local conditions and document the successful installation. Providing geotechnical design expertise and construction oversight throughout the project, GZA bolstered a reputation for extensive geotechnical and environmental capabilities, particularly rock-socketed drilled shafts and instrumentation technology. The challenges of the Sarah Mildred Long bridge replacement are evident and are representative of the progress that innovative engineering consultants are making to improve strategies and push the limits of geotechnical and environmental design. Andrew R. Blaisdell, an associate principal/geotechnical engineer at GZA GeoEnvironmental Inc., can be reached at 207-358-5117 or andrew.blaisdell@gza.com.